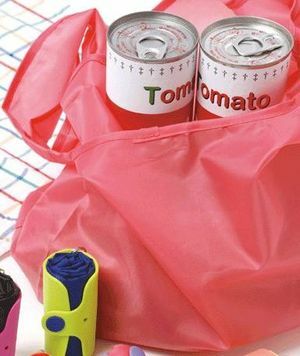 Jonathan Margolis featured this minibag, which compresses to key ring size, in his "Technopolis" column in the March 15, 2008 Financial Times "How To Spend It" magazine. He wrote that it was all the rage when he was in Japan last summer and noted it's just now arriving in the U.K. Being eco-aware just got even more trendy. 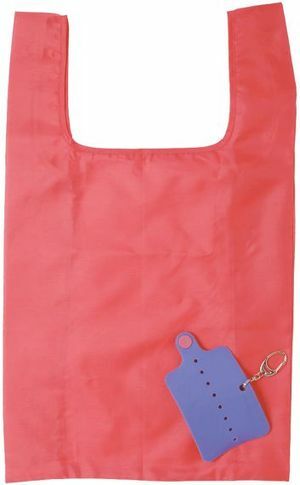 This fold-up shopping bag comes in a range of bright colours. The handle becomes the case which packs up to the size of a pound coin holder. It tucks nicely in your hand bag and works even better as a key ring. It's way more comfortable than lugging plastic carrier bags around. 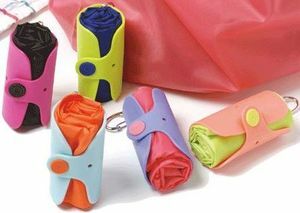 And, it's reusable and way cute. 28cm x 35cm deep (11" x 14"). I am a bit of a convert to the Onya bag myself (http://www.onyabags.com.au/) Super strong with reinforced handles and designed to slot onto the metal rods in supermarkets. The ChicoBag (http://chicobag.com/) is pretty cool too. I think they're about $8.